Ajantha Atukorale received his B.Sc. Degree with honors in Computer Science from University of Colombo, Sri Lanka in 1995. He obtained his Ph.D. degree in 2002 from the University of Queensland, Australia in the field of Neural Pattern Recognition. Currently, Dr. Atukorale is a Senior Lecturer at the University of Colombo School of Computing and conduct lectures for undergraduate and postgraduate programs. His research interests include Neural Networks, Pattern Recognition, Machine Learning, Data Analytics, Computer Networks, and Virtualization. 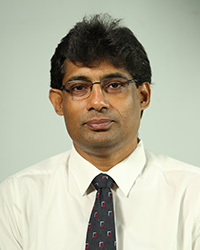 He is a member of the IEEE and a Council member and the Treasurer of the Computer Society of Sri Lanka (CSSL). B.Sc. (Special) Degree with 1st Class Hons in Computer Science, University of Colombo, Sri Lanka, 1995. Ph.D., (Computer Science), University of Queensland, Australia. (Thesis: A Hybrid Learning System with a Hierarchical Architecture for Pattern Classification), 2002. Professor Mohan Munasinghe Award for Computer Studies' for the performances in Computer Science for the year 1995, awarded by the University of Colombo, Sri Lanka. Computer Award 1995' presented to the best undergraduate project by the Sri Lanka Association for the Advancement of Science (SLAAS). CINTEC Award for the best Computer Science final year project in 1995 presented by Computer Information & Technology Council (CINTEC) of Sri Lanka. International Postgraduate Research Scholarship (IPRS) in 1997 awarded by Department of Education, Training and Youth Affairs, Australia. Member of the Institute of Electrical and Electronic Engineers (IEEE) USA. Member of the Computer Society of Sri Lanka (CSSL), Sri Lanka. Acting Director of the Network Operating Center (NOC) of the University of Colombo School of Computing(UCSC). Coordinator of the Computer Science Undergraduate Degree Programs at the UCSC. Secretary to the Board of Study for Research and Higher Degrees at the UCSC. Coordinator of the "LINUX Systems & Network Administration" training Program conducted by the Computing Services Centre (CSC) of the UCSC. Enormous content distribution systems improved broadly with the rapid growth of novel and innovative technologies. Peer-to-peer (P2P) content distribution network (CDN) technologies such innovative technological improvement which claims low cost, efficient high demand data distribution and it gradually involves to the next-generation CDNs. Communications among the nodes of such open network infrastructures commonly perceived as an environment offering both opportunities and threats, which are based on trust issues. Thus, a trust mechanism is required to establish secure communication between the content delivery nodes. This paper introduces a novel, decentralized, cooperative and self-organized reputation based trust algorithm to mitigate the security complications of CDNs. To illustrate the trust model, a novel P2P hybrid network infrastructure has been introduced. The key notion of the research is to validate trust of the target before send or accept the traffic. Furthermore, performance of the proposed trust algorithm is evaluated through the ns-2 simulator in order to analyze the trusted and untrusted behavior of the P2P content delivery nodes.